MOCAP will be exhibiting at the 2016 National Hardware Show in Las Vegas, Nevada from May 4-6, 2016 at the Las Vegas Convention Center. 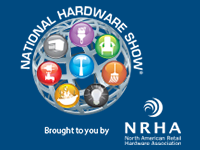 The National Hardware Show (NHS) is held every year by Reed Exhibitions in Las Vegas. It is a housing after-market show that brings together manufacturers and re-sellers of all products used to remodel, repair, maintain and decorate the home and garden. Visit us at Booth #5228 for product demonstrations and free samples of our self-fusing silicone X-Treme Tape.